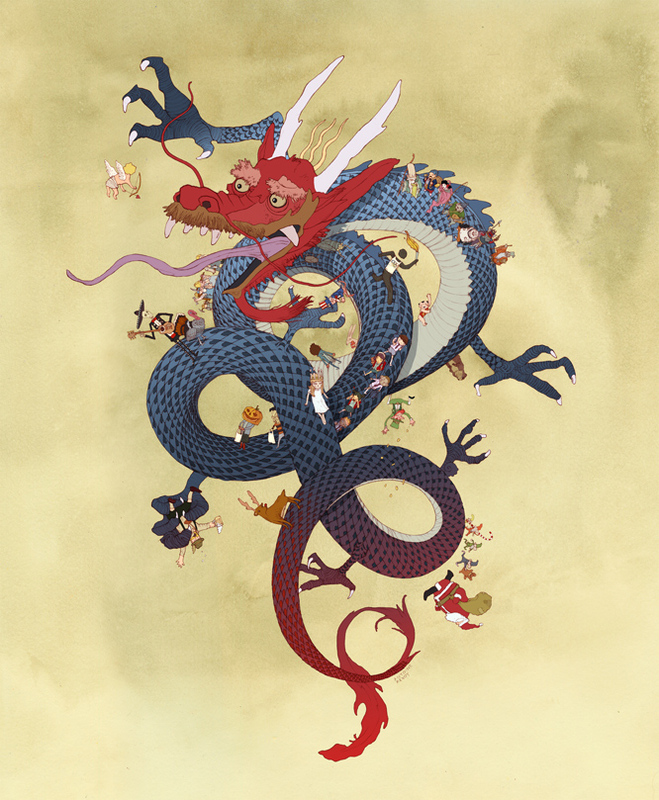 My illustration “Year of the Dragon”, an award winner in the Society of Illustrators of Los Angeles’ annual competition, is exhibited and for sale, framed and signed, in the Illustration West 51 show at the Gallery Nucleus in Alhambra, CA. This entry was posted on Friday, March 08th, 2013 and is filed under Awards and recognition, Exhibitions, Illustration, Shows. You can follow any responses to this entry through the RSS 2.0 feed. Responses are currently closed, but you can trackback from your own site. Award-winning illustrator Kelly Murphy from Massachusetts, USA. Illustration professor and journalistic artist Fred Lynch. Actionscript developer and project manager based in Paris, France. Web designer, front-end developer and graphic artist Sven's portfolio. Developer, project manager and entrepreneur Julien Oger. French multimedia designer and v-jay "Zen" Baptiste Auric. Charles Takashi Tsunashima's design company in Tokyo, Japan. The animal robot sculptures and figurines of artist Ann P. Smith. Comics artist, illustrator and melomaniac Evan Larson's blog. The wonderful characters, animations and games of the Zip Bear's creator Sachie Sakai. Creative culture e-zine from Germany by stylefighter Patrick Hartl. California-born illustrator Bill Tsukuda's paintings. Authoritative American daily newspaper published in New York City since 1851. The cultural supplement of German magazine DER SPIEGEL. Leading international banking and financial services group originating from Paris, France. American multinational toy and boardgame company, the world's largest toy makers. American luggage - suitcases, bags and briefcases - company. One of the oldest trade publishers in the United States and a part of Macmillan.